Happiness is getting together for a good cause. It’s even better when you’re doing it with a game you enjoy. It’s even better when it becomes a networking event where you can meet additional people beyond those who you know. Especially when you already know quite a few and it’s in your business. Such is the case of the Recording Industry Poker Tournament. It was a charity event that I partook in. It was a heck of a lot of fun. I’m happy about the outcome and I look forward to attending again next time. Performing at the release of the Bruno/Universal/APM American Youth Rock Library release. Shared the stage with some big names in the industry and had lots of fun doing it. Sang on a video game coming out later this year in Japan. More details on that in the coming months. Playing shows as they come up. Recently did a set in Frazier Park, CA. 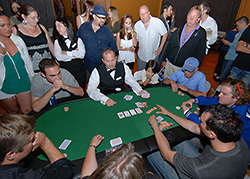 Played in a music charity poker tournament for Sound Art LA. Shared the felt with some of the big names in mixing, mastering, engineering and production, along with a few musicians. When the dust settled, I stood victorious for a great cause – I’m sure there will be pictures of me with the winnings appearing online soon. Please donate to their organization so kids can still get a music education in Los Angeles. I will be speaking on a panel at SESAC’s Songwriter’s Bootcamp this Friday August 6th at the Skirball Center. I’ll be giving my thoughts on what it’s like to be a songwriting musician in the video game world. Stay tuned more good things are afoot.